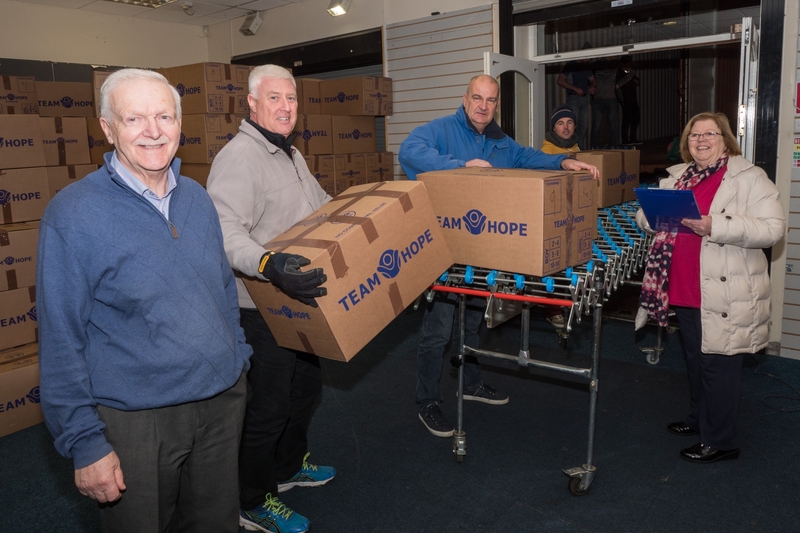 Over 17,000 shoeboxes full of Christmas joy were donated by Kildare for the Team Hope Christmas appeal this year. A total of 8,000 boxes were shipped from South Kildare and over 9,000 from North Kildare. The South Kildare volunteers packed up the truck at the Courtyard Shopping Centre in Newbridge last night. Volunteer Breda Healy explained how the boxes are now on their way to Malawi. "We are delighted with the response. We would like to thank all the drop off centres - Axa Insurance in Naas, Healy Tyres, parish centres in Newbridge, Naas and Prosperous, all the schools, the parents and everyone who donated a shoebox. We are also extremely grateful for the use of the unit at the Courtyard Shopping Centre in Newbridge where we could sort the boxes and get them ready to go," she said. "We also want to mention our knitters, who have been making dolls and other fantastic items for the boxes all year round." A total of 30 volunteers had been working hard over the past few months to collect, sort and get the boxes prepared for their trip. Breda highlighted the difference this Christmas present makes to so many children every year.